This modernization of the T-34 can be considered a new tank. A total of 21,048 vehicles were produced from 1944 through the end of World War II. The T-34-85 Victory is a holiday version of the traditional T-34-85. The tank features special camouflage. 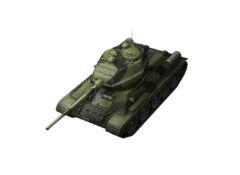 A special premium version of the T-34-85 made available for a limited time as part of the Victory Day special event. This tank is so far one of the only four tanks in Blitz (Pre patch 2.5) to possess any type of camo or design (The others being the E 25 "#1", Snowstorm Jagdtiger 8,8 and the T34 1776). This tank features a slightly faster ROF compared to the T-34-85, at the expense of less accuracy. Generally considered a quick and versatile tank that is easy to play. This page was last modified on 19 May 2017, at 15:06.